Drove down to SW France in April (should have been going to the Canaries but the Icelanders decided to prevent me going). In the whole trip saw just one 75 and that was in the SW. Couple of weeks ago drove down to SW France, stopped overnight and then to Costa Brava. On the A71 between Orleans and Vierzon was passed by not one but two 75s and both were from different departments. On the Coasta Brava in Malgrat parked in one of the bays by the side of the road outside some of the hotels was parked a 75 - and this one on Swedish plates. Upholding a GREAT BRITISH tradition. France has indeed been a very lucrative market for the 75. Here in Rennes (a city of no more than 300,000 inhabitants), the ex-Rover garage sold 400. Try looking round Normandy, Brittany and also the Paris region, where there are still plenty. Someone more knowledgeable will correct me but I believe a ZT was taken in as a personal import. 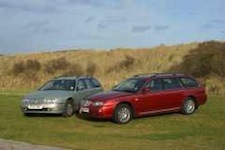 In additon, there are 3 test cars that had winter testing carried out, the ECUs were then removed and brought back to the UK for reprogramming to be taken back out for summer testing but before they went back out MGRover went pop. As a PS there are some photos on the AROnline site showing side trims with side markers and assumed a prototype for the US market.